For the classic 1/537 scale USS Enterprise from “Star Trek: The Motion Picture”. 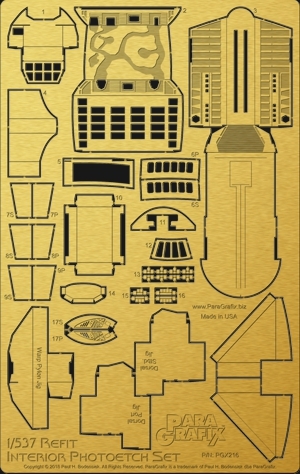 This 0.01” thick photoetched brass set includes three interior spaces of the ship: the officers lounge, the arboretum, and the shuttle bay. The lounge and arboretum also include window frames to help make these areas visible. The lounge also includes in-scale seating. The shuttle bay includes replacements for the ship’s transom (with through etched areas suitable for lighting*) and retracted door sections. All three rooms include provisions for overhead lighting*. Also included are five jigs to help position main components of the ship (primary hull, dorsal, secondary hull, warp engines, and pylons) properly.